Keep your table clean and show your allegiance to the dark side at the same time with this Star Wars 3D Death Star Glass Coaster 9-Pack Set! 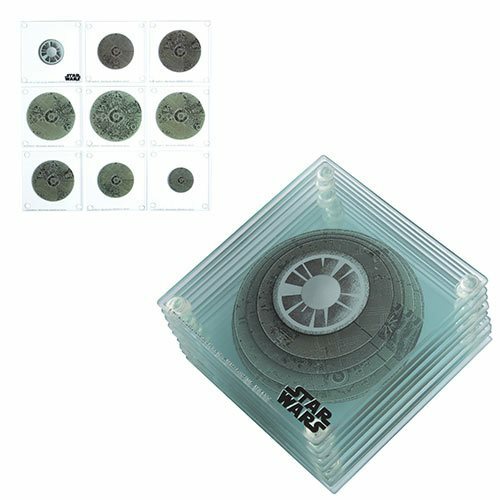 Each of the 4-inch square x 1/4-inch thick coasters in this stunning set features grip footing to keep it in place and a cross-section of the Death Star, increasing in size and then decreasing to create a 3D effect. When stacked, you see the Death Star in 3D! Wipe clean with a damp cloth. Hand wash only. Not dishwasher safe. Do not microwave.